The changing face of achieving equity in health, education, and housing in the United States. For more than a century, American reformers have struggled to remedy the problems of poverty in the places where low-income people live. At first, these social improvers could muster only a few isolated solutions, but by the end of the 20th century, they had expanded their efforts to a large, dynamic, and sophisticated field of action. Today thousands of nonprofit community development organizations operate in the poorest urban and rural areas of the country. More impressively, they have helped stabilize community life and individuals and families in some of the most forsaken neighborhoods in the country. To build a decentralized system of neighborhood improvement and individual betterment was not easy. The community development field had to emerge from the shadow of the top-down approach embodied in the urban renewal and public housing bureaucracies. The anti-poverty crusaders realized that they had to combine a passion for social justice with viable management and business practices. They had to learn to keep practitioners accountable for their work and to measure their accomplishments. In 1966, Bobby Kennedy and his aides conceived the idea of a “community development corporation,” a prototype of which they worked to set up in Brooklyn’s Bedford-Stuyvesant neighborhood. As Daniel Patrick Moynihan put it, the Bedford-Stuyvesant project would “get the market to do what the bureaucracy cannot.” With the support of New York Republican leaders Senator Jacob Javits and Mayor John Lindsay, Kennedy persuaded Congress and the administration in November 1966 to amend the Economic Opportunity Act by adding the “Special Impact Program” to fund community development ventures in urban poverty areas. During the late 1960s and 1970s, various nonprofit organizations that were focused on different aspects of neighborhood development began to appear in poor inner-city and rural areas, including many riot-torn areas; next followed intermediaries serving them. In 1968, Dorothy Mae Richardson and her friends in a block club in Pittsburgh’s Central Northside neighborhood were fighting slum rats and landlords. The club’s efforts to get housing loans for their low-income neighbors attracted the attention of local bankers and foundation officers. The block club, a local bank, and the foundation set up a novel program to give home improvement loans and advice to residents whose incomes made them look too risky for fearful conventional bankers. They called the new lending agency Neighborhood Housing Services (NHS). In 1970, the Federal Home Loan Bank joined the Department of Housing and Urban Development (HUD) under Richard Nixon to create a task force that would expand the NHS concept across the country. 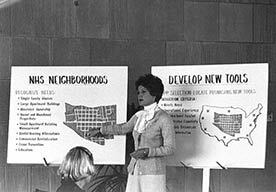 In 1978, with 60 Neighborhood Housing Services now operating around the country, Congress turned the task force into an independent entity, the Neighborhood Reinvestment Corporation, now called NeighborWorks America, to support and strengthen the NHS system. At the Ford Foundation in the late 1970s, Mitchell Sviridoff, head of urban operations, shifted the philanthropy’s emphasis from strictly social services to economic development and housing. With the help and support of Franklin Thomas, the former head of the Bedford-Stuyvesant Restoration Corporation who had recently become president of the Ford Foundation, Sviridoff worked out the idea for a large independent organization to assist CDCs. Using a grant of $9.3 million from the Ford Foundation and six major corporations, Sviridoff in 1980 established the Local Initiatives Support Corporation (LISC) to give loans, grants, and technical assistance to CDCs. Four years later LISC had obtained more than $70 million from 250 corporations and foundations and three federal agencies and set up 31 branch offices, which raised funds from local sources. The idealistic real estate developer James Rouse set up the third national financial intermediary. As in the other cases, his idea germinated from a small beginning. Terry Flood and Barbara Moore, two women who were part of a social mission group of the ecumenical Church of the Saviour in Washington, D. C., wanted to save two decrepit apartment buildings in the Adams-Morgan neighborhood. They turned to their fellow church member Rouse for help. Although he counseled against the idea, he supported the church members when they formed a nonprofit community development organization, Jubilee Housing, to renovate run-down properties for poor people in Adams-Morgan. Impressed, Rouse and his wife, Patricia, decided to create a national institution, and in 1982 founded the Enterprise Foundation to assist entities of all types interested in developing low-income housing. Like LISC, the Enterprise Foundation (now called Enterprise Community Partners) grew quickly. In 1982 it supported six groups in six locations; six years later, Enterprise had made $5.8 million in loans and grants and had expanded its network to 54 organizations in 27 locations. In the years that followed, both LISC and Enterprise would continue to expand their operations and finances by leaps and bounds. Activists in different parts of the country also began creating social banks that would make loans to nonprofits for projects that regular banks shunned. From the broader credit union movement came community development credit unions. Meanwhile, religious groups had begun to build a movement to provide capital to social mission projects. In the early 1980s, social investment in the United States gathered momentum. In 1994, Congress responded to the increase in community development lending by establishing the Community Development Financial Institutions Fund in the Treasury Department. Since that time, the fund has made equity-like investments in hundreds of community development financial institutions (CDFIs). Although philanthropic and nonprofit support helped the movement to grow, government funding, especially federal funding, was essential if community development was to thrive on any significant scale. Under both Republican and Democratic presidents, the federal government gradually became an indispensable source of funds for the community development system. The landmark Housing and Community Development Act of 1974 replaced the unpopular urban renewal program, the idealistic but poorly conceived Model Cities, and other categorical programs with community development block grants (CDBGs) to local governments. Although the act allowed governments to use block grants for a range of activities, it required that at least some of the funds help low-income families. Three years later, the Carter administration reinforced this goal through the Urban Development Action Grant program to target additional funds to inner-city areas in extreme economic distress. With these prods, many local government agencies began to contract redevelopment work to neighborhood nonprofit organizations, including community action agencies and CDCs. Although in 1986 Congress eliminated key tax incentives for real estate development, it replaced them with the Low-Income Housing Tax Credit, which proved to be one of the most powerful housing programs ever devised. And in 1990, the government specifically recognized the work of nonprofits by setting aside funds for them in the HOME program. By the 1980s, forces that would encourage the revitalization of the inner city, such as immigration and a renewed interest in urban living, began to gather some momentum, but during the 1980s and 1990s, the community development movement provided the most visible signs of new life in the inner city. Across the United States, but especially along the East and West coasts and in the Midwest, the number of local CDCs in storefronts and church basements began to multiply. Yet the road to community development was rough. The original notion, dating from Kennedy’s experiment in Brooklyn, was that ghettos were backwards places of low employment. Hence, in the 1970s and 1980s, community development advocates endeavored to lure large corporations to set up factories in the inner city, with only mixed success. Old buildings were not necessarily efficient for modern production, locations were not always near highways, and sometimes labor costs were too high. Because of their economic development goals, leaders of CDCs also tried to stimulate small-scale enterprises. Community development groups that invested directly in local supermarkets and restaurants often lived to rue the day, if they survived the ordeal. These kinds of early business failures were valuable, if painful, learning experiences for the new grassroots practitioners of community development. Gradually they gained professional skills in real estate development, finance, and management and an appreciation that business methods and discipline were necessary tools for the pursuit of their social and economic goals. Through trial and error, the community developers learned that housing, for which there was both subsidies and demand, provided a viable business model. Across the country the new wave of housing developments stabilized the lives of low-income people and served notice that their neglected neighborhoods were worthy places in which to live and invest. CDCs during the 1980s and 1990s sparked revivals in inner-city neighborhoods from coast to coast. In the Roxbury and Dorchester neighborhoods of Boston, on the West Side of Chicago, in South Central Los Angeles, savvy CDC directors helped fill in the unsightly and dangerous vacant lots and buildings on their streets. In Washington D.C., the pioneering efforts of Jubilee Housing in Adams-Morgan and the Development Corporation of Columbia Heights helped ignite a process that by the 2000s would turn these once-crime ridden and dwindling communities into booming fashionable districts. Although new housing development could make a dramatic impact on fortunes of a low-income neighborhood, the leaders of the effective groups believed that housing was only one component of community development. In addition to housing development, groups such as the Vermont-Slauson Economic Development Corporation in Los Angeles and Greater Southwest Development Corporation in Chicago helped to start or expand businesses and revive inner-city commercial thoroughfares. Organizations such as Newark’s New Community Corporation offered a broad array of social services including child care, job training, and drug rehabilitation. Some groups introduced medical clinics to their neighborhoods. A few, such as South Bronx Churches, operated schools. In Atlanta, the Reynoldstown Revitalization Corporation developed housing and ran parenting classes, classes for school drop-outs, an anti-drug program, and an annual community arts festival. The broad range of activities pursued in the name of community development reflects the recurring theme of holistic urban revitalization that appeared in 19th-century settlement houses, reemerged in New Deal projects, and inspired Great Society anti-poverty efforts. During the heyday of community development, it reappeared specifically in the form of “comprehensive community initiatives” or CCIs. During the 1990s, foundations and intermediaries supported, and often initiated, numerous comprehensive community initiatives. In general, the collaborative groups created by these comprehensive initiatives took on a diverse range of neighborhood issues — such as safety, education, housing, social services, employment, and collective action — and accomplished a great deal of good. Yet the projects tended to be isolated “one-off” deals, which the new collaborative organizations either maintained as specialized activities or let expire once the funding ran out. More to the point, the holistic improvement of a neighborhood by many parties working together synergistically never happened. Comprehensive community initiatives bogged down for a variety of reasons: vague goals, strained relationships between the visionary officers of sponsoring foundations and leaders of local organizations, lengthy deliberations of community groups over the agenda, and strategies that were not always lined up with other community efforts. With some notable exceptions, such as the MacArthur/LISC New Communities Program in Chicago, many philanthropies by the 2000s had backed away from comprehensiveness as a goal. By the start of the new millennium it was clear that the map of poverty had changed once again. In the large cities where the community development movement was strongest, the changes that had begun in inner-city communities now reached or passed a tipping point. Where once only a CDC or a few urban pioneers had seen the potential value of a neighborhood, an influx of upper-middle-class and wealthy professionals had driven up rents and home prices far above what unsubsidized low-income families could pay. In such gentrified places, subsidized affordable housing projects built in an earlier era of economic need now helped maintain a mixed-income character. Immigration also transformed the ethnicity of neighborhoods. Arrivals from Latin America, the Caribbean, and Asia had begun to write their own chapters of the history of their neighborhoods. Poverty had by no means disappeared, and after a long decline began rising again, while population movements expanded the geography of poverty. Some poor people continued to reside in the old inner-city neighborhoods, some of which had extremely high rates of poverty. But increasingly low-income Americans, like their better-off fellow citizens, moved outwards in search of better homes, schools, and recreation. Both low-income African Americans and immigrants, long associated with inner-city neighborhoods, moved to the suburbs. Between 2000 and 2010, the number of poor people living in suburbs soared by 53 percent, twice the rate it grew in cities. The problem was that the governments of these smaller towns often lacked the budgets, staff resources, and access to state and federal programs that large city administrations had. During the 1990s, some in the field grew frustrated that too many community development efforts were restricted to one or another form of real estate development. Perhaps the greatest change in thinking in the anti-poverty field was the widespread adoption of the concept of asset building. The idea of asset building changed the overall priorities by focusing on increasing the wealth of individuals, not improving neighborhoods. Place-based community development was hardly dead, however. By the early years of the 21st century, community development activities and institutions had spread across the United States. The once experimental organization known as the community development corporation had become established in the American landscape. By 2002, the number of CDCs had multiplied to 8,400 and they could be found in large cities and rural areas in each of the country’s major regions. The community capital field that supports them boasts more than 1,000 CDFIs in cities, rural areas, and Native American reservations. Since 1980, LISC has invested $11.1 billion ($1.1 billion in 2010 alone) in community development, which contributed to $33.9 billion in total development of 277,000 affordable homes and millions of square feet of retail and community space, not to mention schools, child care facilities, and children’s playing fields. Similarly, since 1982, Enterprise Community Partners has collected more than $11 billion in equity, grants, and loans to help build or preserve nearly 300,000 affordable rental and for-sale homes and provide more than 410,000 jobs nationwide. By 2000, NeighborWorks America and its affiliates had reached an annual direct investment in economically distressed communities of $1 billion. The network included 235 local nonprofit organizations, which served more than 4,500 neighborhoods. Since the economic downturn, its prodigious home buying and counseling machinery has turned to foreclosure mitigation counseling and administering mortgage payment relief. Even as the government, banking, and philanthropic systems of financial support grew strong in the new millennium, community development organizations were forced to confront new and not always pleasant realities. The leaders of the founding generation had aged, and many now retired from the business. The ranks of community development organizations thinned significantly, dropping by about half from 2002 to 2010. CDCs increasingly turned to partnerships with other organizations and institutions as a way of stretching their resources and the scope of their activities. Some CDCs expanded into new service areas, either to take up the slack of groups that had gone out of business or to inaugurate community development in new territories. Increasingly local groups and governments turned to large specialized nonprofit housing companies for housing development. (See p. 24.) Regional and national groups such as Mercy Housing, National Church Residences, BRIDGE Housing Corporation, and The Community Builders operated with a business acumen — including asset management officers — and size of real estate portfolios that compared well with for-profit real estate companies. With such skilled and yet socially committed organizations, it did not seem necessary for as many small groups to develop housing on their own. For all the unsettling changes, community development was in many ways stronger than ever. The growing popularity of investing to achieve a social goal, against which specific results could be measured, channeled new funds and new energy into community development. A number of efforts demonstrated the persistent appeal of integrated, if not absolutely comprehensive, approaches to effect social change. The Harlem Children’s Zone has inspired the Obama administration to institute the Promise Neighborhoods program. Significantly, this community development program resides not at HUD but in the Department of Education. Its purpose is to nurture young people, starting from the cradle and ending with a career, and it takes an approach that would sound familiar to those who invented the Model Cities program 50 years ago: coordinating and integrating programs across agency boundaries. The field of community development has grown immeasurably since the dark days of top-down policies such as urban renewal. Today it stands on the threshold of new synergies, but it also faces challenges as never before. The people in this dynamic industry must apply the knowledge gained through past experiences to new and difficult circumstances. If history is a guide, they will rise to the occasion. This passage is an edited excerpt from a chapter of Investing in What Works for America’s Communities: Essays on People, Place & Purpose by the Federal Reserve Bank of San Francisco & Low Income Investment Fund. Alexander Von Hoffman is a senior fellow at the Joint Center for Housing Studies of Harvard University and a lecturer on urban planning and design at the Harvard Graduate School of Design.